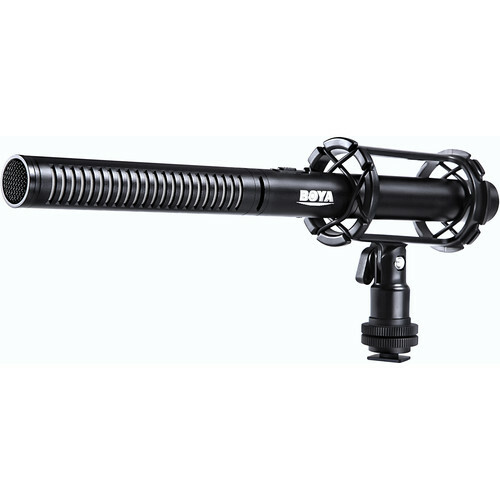 The BY-PVM1000 Professional Shotgun Microphone from BOYA is a supercardioid shotgun microphone that delivers broadcast-quality sound in the studio or on location. It maximizes the rejection of sound coming from the sides and rear of the mic and can be used as a directional microphone to capture natural-sounding audio for speech and dialog. The shotgun microphone is built with a 3-pin XLR connector and includes a shockmount, a 4.9' XLR to 3.5mm cable, 3.5mm to 1/4" adapter, fur windscreen, and carrying pouch. It is powered by a 48V phantom power or an AA battery. In addition, it is equipped with a switchable 80 Hz high-pass filter. This mic offers low-noise and transparent audio reproduction that ensures a clean signal even in high-output conditions. Box Dimensions (LxWxH) 13.3 x 4.6 x 2.95"